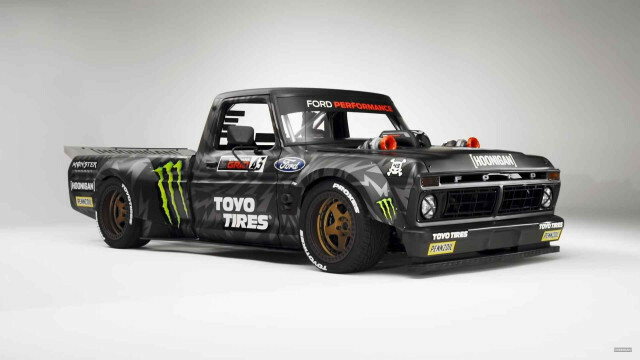 Rallycross racer and entrepreneur Ken Block is working on the tenth episode of his gymkhana series of videos, aptly named “Gymkhana 10,” and on Wednesday he revealed one of the vehicles set to appear: a heavily modified 1977 Ford F-150 dubbed the Hoonitruck. In case you’re wondering, gymkhana is all about going around a set course as fast as possible, and usually that course consists of varying surfaces, major obstacles and sometimes a jump or two. In Gymkhana 10, there will be five locations, one of them the streets of Detroit. The Hoonitruck, the name a reference to Block’s Hoonigan squad, is packing an all-wheel-drive system and 914 horsepower and 702 pound-feet of torque. However, there’s no V-8 lurking under the hood. Instead, Block has chosen a 3.5-liter V-6 whose design is derived from the unit powering Ford’s GT race car. The power is routed to all four wheels via a Sadev six-speed transmission (similar to the one used in Block’s Mustang-based Hoonicorn). Chassis, bodywork and fabrication was all handled by Detroit Speed, in Mooresville, North Carolina, with the overall design and styling of the project dictated by Block and the rest of his Hoonigan squad. This particular vintage of F-150 has a special spot in Block’s heart. Block’s late father owned one, and it’s the model Block learned to drive in when he was 15 years old and would later use to attend his first dirt bike races. Gymkhana 10 drops as an early exclusive on Amazon Prime Video on December 7, followed by a global release on the Hoonigan YouTube channel ten days later.